As a speech-language pathologist and a blogger about speech applications, I often get asked about AAC applications. None of my students require assistive technology to communicate, but a few use visual schedules, social stories, and keyboards to type their responses during assessments. One visual schedule application that I have used is Choiceworks. Choiceworks, developed by Bee Visual LLC, is available for the iPhone, iPod Touch, and iPad for $14.99. Based on the physical product (Choiceworks Visual Support System), you can create schedule boards, a waiting board, a feelings board, and read social stories all in one application! Continue reading my review of Choiceworks below and enter the giveaway at the end. The main page of this application shows the options to create and use Schedule Boards, Waiting Boards, Feelings Boards, Companion Books, Image Library, and Settings. You can turn on/off the ability to edit boards. This way, if a child is using the application, he or she will not be able to edit them during use. You can also edit the board audio to be on/off. This controls whether or not the words will be read aloud when an image is tapped. You can turn on/off Board Help to show the help button on the boards or not. Finally, you can import boards from iTunes and read more about the application, developer's website, and version of the app. Multiple Schedule Boards can be saved to a schedule list such as daily schedules or a routine for getting ready for bed. Press on the squares to choose an image from a menu. At the end of the schedule, the child is given a choice of an activity. Finally, you have the option of adding timers to each task. A Waiting Board can be created for a child to show options of what he or she can do while he or she is waiting. The board shows the reason why the child is waiting, such as having quiet time, not interrupting, or waiting his or her turn. You can set a timer for how long the child has to wait for up to an hour. 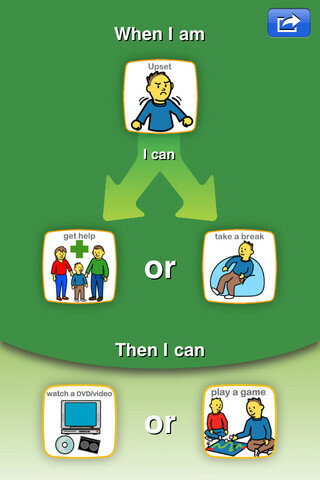 You can also decide which two tasks the child can do while he or she waits. The last type of board you can create on this application is a Feelings Board. Choose a feeling and then choose two appropriate choices for actions that the child can take when feeling that way. At the bottom of the board, it allows two choices for what a child can do once they have completed a strategy from above. Each board has a Companion Book that goes with it. You can access these books via the boards or on the Menu list. There are three different books – “Things I Do Everyday”, “When Do I Have to Wait?”, and “When I Get Upset”. These are social stories that explain how to use the boards in a way that young children will understand. 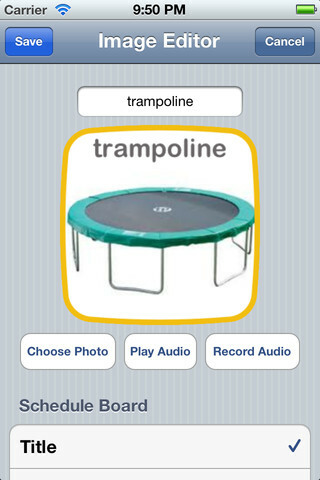 The application comes pre-loaded with many images of activities, emotions, places, and classes. However, you can add your own images to the Image Library to use in any of the boards. Take pictures of real-life images of objects that the child uses in everyday life, the child practicing various emotions, and specific activities/rewards that the child can do. Within the Image Library, you can choose which boards each image is available for and if it is your own image, you can add text and audio to it. I love the fact that you can save multiple Schedule Boards to the application. My students do not have the same specials every day of the week, so it is great to have the ability to have a schedule for each day. You can also save multiple Waiting Boards for different situations and Feelings Boards. The Companion Books are great for teaching students about using the boards as well as other social skills. You can add your own images to the Image Library which is helpful for students who need real-life images of everyday activities, tasks, rewards, places, people, and more to relate to. It is great that you can add timers to different tasks so that students are aware of how long they have to complete a task. Moving tasks to the “All Done” side is easy with just a swipe of a finger! 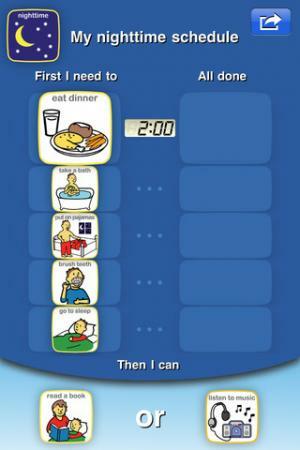 Then, the child can see which tasks have been completed and which need to be done still. Visuals and audio reading of the text are helpful for students who have difficulty reading. The application has both an edit mode and a viewing mode. This makes it easy for therapists/parents to choose the tasks and set the schedule for the child while making sure that the child does not edit the settings. Help for how to use each board and audio can be turned on or off as well. You have the ability to import boards from files via iTunes so that they do not take up space on your iPad. Also, if someone else creates and shares a great board, you can upload it to your iPad. I would love it if you could scroll through activities or flip through various parts of single day so that you can add more tasks to a schedule if needed without cluttering the page. Since there are so many great icons for various tasks, it would be great to be able to create social stories within the application similar to the Companion Books! It would be a great addition for users to have the ability to create their own templates for schedule boards, goals, to do lists, waiting boards, feelings boards, or social stories. User profiles would be great for therapists who work with multiple students who could use the application. 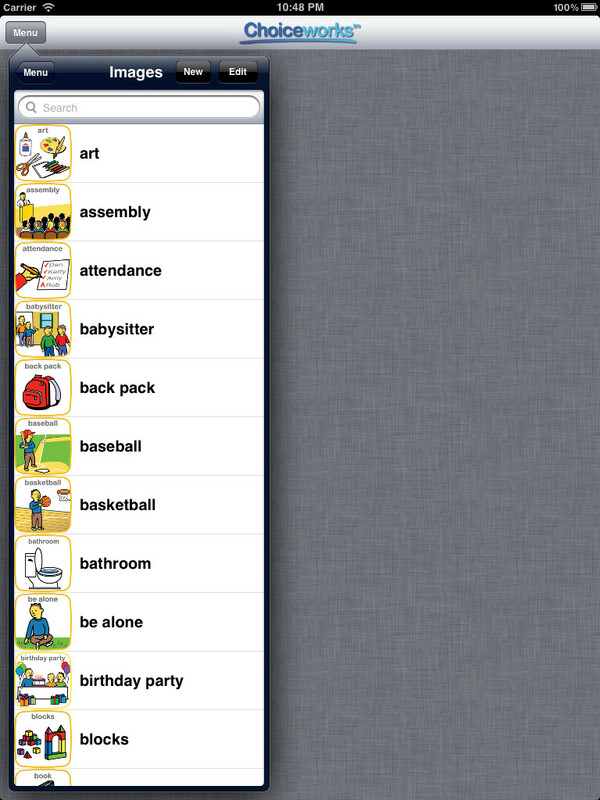 Overall, this application is great to use with students who have pragmatic language disorders, autism spectrum disorders, anxiety, or need a visual schedule. The price is great for all that is included as well as the fact that the boards are able to be edited with personalized images. I would definitely recommend this application! For further instructions of how to use this application, visit Bee Visual LLC’s website or view their tutorial video on YouTube. Choiceworks is available for $14.99 (on sale for $9.99 at the time of this review) for the iPhone and iPad. 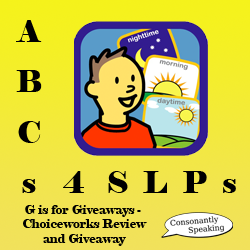 Consonantly Speaking received a code to give away for the "G is for Giveaways" event. No other form of compensation was received.